As more and more carmakers rush to enter into the electric and hybrid car segment, annual capacity in China is about to exceed 7 million units by 2020. According to China Association of Automobile Manufacturers (CAAM), passenger car sales increased 15.3% to 24.4 million units in 2016, while commercial vehicle sales achieved 5.8% growth, reaching 3.65 million units. The key driving force for this sales surge was a tax incentive policy on smaller cars. However, the government has meanwhile replaced the tax incentive by a higher rate. Therefore, total car sales growth slowed down to 3.8% in H1 of 2017, with passenger car sales increasing only 1.6%. 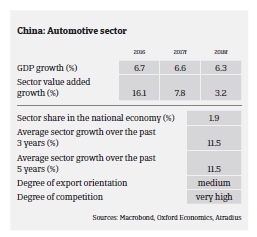 The SUV segment is attracting more and more customers due to persistently low oil prices, while the easing of the one-child policy prompts families to choose large vehicles when they have a second child. SUV sales increased 45.7% in 2016, and their market share increased to 40.5% end of June 2017. Sales of commercial vehicle sales grew 17.4% in H1 of 2017, to 2.1 million units, benefitting from surging commodity transportation demand and more infrastructure projects. New energy vehicles (electric and hybrid) is a fast growing segment in China. The government has put about CNY 33 billion (EUR 4.3 billion) of subsidies into this segment so far, aiming for sales of new energy vehicles to reach 2 million by 2020 and to account for more than 20% of total vehicle production and sales by 2025. As carmakers rush to enter into this segment, annual capacity is about to exceed 7 million units by 2020. Potential overcapacities aside, fraud is an issue as some automakers have cheated subsidies on unsold or inoperable vehicles. As a consequence, the Chinese government has set several strict regulations, such as raising technology standards to narrow model list. 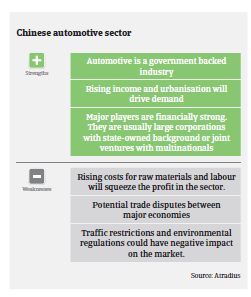 We see automotive manufacturers as strong businesses, because of the segment’s capital, technical intensity and the growth potential of the Chinese vehicle market. Our underwriting strategy remains open, but we are more cautious towards manufacturers of domestic brands than we are to joint ventures. We look mainly at cash flow and profitability when considering applications for cover. The majority of core parts suppliers (engines and related equipment) in China are foreign-owned, including many strong businesses (e.g. Bosch, Continental, Magna, ZF Friedrichshafen, Delphi, etc.). The non-core parts segment (lights, meters seats, axles, tyres, etc.) is composed of a variety of manufacturers. When underwriting this segment, we focus on whether they are overly export-oriented, in view of the on-going anti-dumping policies against Chinese enterprises that can lead to export barriers. We also take into account suppliers´ customers, for instance a major brand such as Volkswagen or Ford, and whether the parts supplied are ‘core’, such as engines or axles, and if a patent or special technique is involved. We are extra careful with smaller companies in this segment because of their poor equity, which could lead to insolvencies. Unlike other manufacturers, businesses in this segment may have difficulty obtaining bank finance. On average, it takes car manufacturers and suppliers about 90-120 days to collect debts. In the car dealing segment, average creditor days are about 40-60 days. 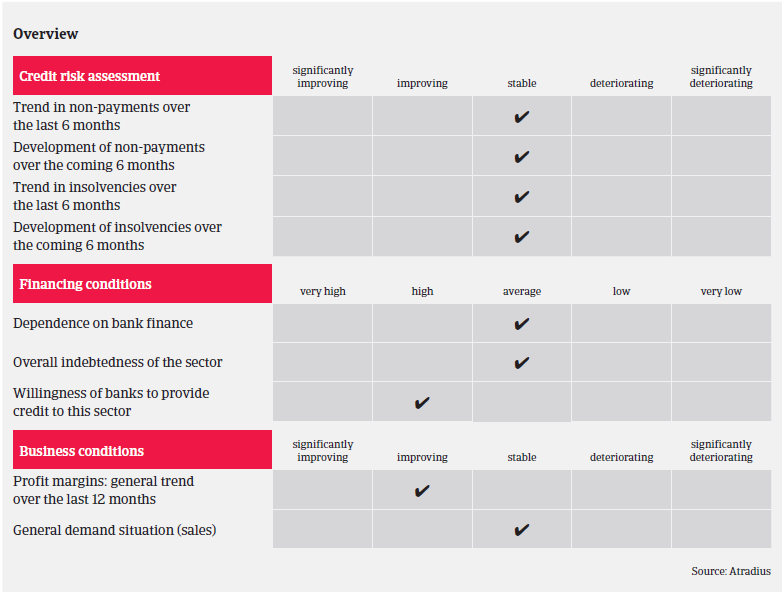 We expect longer payment terms in the future due to increasing liquidity pressure on buyers. Payment experience has been satisfying over the past two years, and non-payments are not expected to increase in the coming months. The level of automotive insolvencies is low compared to other industries, and business failures are not expected to increase in 2017. The Chinese chemicals industry has entered a phase of lower but still solid growth, with chemicals demand growth rates still above global average.